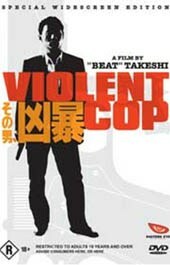 “Beat” Tekeshi Kitano is the star and director of Violent Cop. It’s also his directorial debut. Kitano stars as Azuma, a senior and jaded detective that is not a great representative of law and order. A ruthless and somewhat sadistic cop, Azuma will do whatever it takes to get an outcome, even if it means belting the crap out of a suspect. In the first five minutes of the film we see a gang of thugs picking on an innocent man and you just know they need their come uppance. Azuma provides this and more, beating the snot out of one of the offenders and then humiliating the attacker further. Kitano does a brilliant job portraying Azuma as the recluse cop who goes over the edge. Unlike the Charles Bronson character in Deathwish, Kitano’s Azuma is a character that you never really look upon as the hero. He is so devoid of passion, even rage doesn’t seem to be there to be a key force behind his anger. This however brings out the characters of all the other players in the film, it’s a unique approach which punters will enjoy. There is a fair bit of violence in this flick which is not surprising consider the title. It’s done in the older style though with minimal special effects which for some reason made it all appear that much more brutal. Good depictions see to it that whilst it appears a bit hokey at times, it’s never enough to put you off. Video is a bit grainy on this release however it is still awesome to watch. Audio again is very ordinary but does the job. Some of the weapons sounds are quite unconvincing, or is it just that we are used to the Hollywood boomsticks? You decide. Extras are simply Eastern Eye trailers.